2018 was an exceptional and truly momentous year for Lamborghini, full of successes and marked by the introduction of its third model, the Super SUV Urus. This is a vehicle that has opened up a new era for Lamborghini and one that became highly desirable immediately, with orders exceeding even the most optimistic expectations. The Lamborghini Christmas Drive was held to bring a positive and intense year to a fitting end: a 750 kilometer long tour held on 13 and 14 December to test the handling of the Urus and of its predecessor, the LM002, in wintry conditions and on mountain roads that heighten the pleasure of being behind the wheel and the sporty feel of both vehicles. 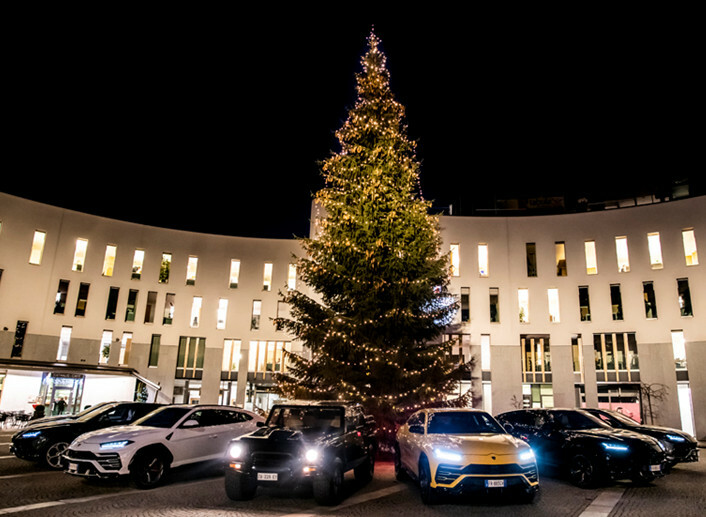 The city of Bruneck has long been a friend of Lamborghini and from where the spectacular Christmas tree in the Sant’ Agata grounds comes: the city welcomed the convoy to the old town center and the Christmas market. The brightly decorated shop windows and Christmas stalls provided a magical backdrop for the cars, with many sporting special displays, and even biscuits baked in the shapes of the two models for the visit. The Lamborghini group was accompanied by the usual bright blue sky and sub-zero temperatures as they made their way to Lake Braies, now completely frozen over and covered in white, a location offering the ideal occasion to try out the vehicles in snowy conditions. The Lamborghini Urus is the vehicle that has led Lamborghini to double its production site, going from 80,000 to 160,000 square meters in just over a year; increasing the number of its employees with 500 new recruits; and to an estimated doubling of sales volumes by 2019 compared to the period prior to its launch. The Urus is the most powerful SUV in the world: it has a 4-liter twin-turbo V8 engine, delivering 650 HP and 850 Nm of torque to guarantee maximum performance. It accelerates from 0 to 100 km/h in 3.6 seconds and can reach a top speed of 305 km/h. The black LM002, a third series owned by Lamborghini, chassis #12231, was built in 1990 and delivered to dealer Mediterranea in Nice (France) for collection by its first owner, a resident of Monte Carlo. It was subsequently reacquired by Automobili Lamborghini and then underwent a complete restoration by Polo Storico. The work started in 2016 and concluded in 2017, including the bodywork and interiors and a thorough overhaul of the mechanics. Based at the company’s HQ in Sant’Agata Bolognese, Lamborghini Polo Storico is the specialized unit dedicated to the restoration and certification of Lamborghini models that have been out of production for at least ten years (from the Lamborghini 350 GT to the Diablo). The division is also in charge of preserving archives and records, and of managing the supply of original spare parts for classic cars.